The past couple of months has seen intense discussion in the SEO industry evaluating Google’s Pigeon update and its effects on “Local” results. A major issue has been the volatility of the results (especially the “7-pack”) and sometimes contradictory conclusions of different commentators. In this article I want to present some of the findings from our own research, showing that we may not even be able to depend on some of the research data itself! When comparing data, it may be that we don’t even realise what we’re looking at may not be the same as local users are seeing for seemingly identical searches under the same conditions. 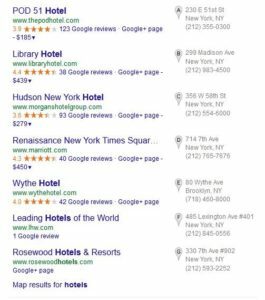 Based on a Midtown Manhattan NY location, we started with a desktop web Google search for the search term “hotels”. This indeed gave Universal search results with a 7-pack related to the Midtown area. The Hotel at Times Sq. There are only two results that appear in both the Universal 7-pack and the referred Google Maps result set (Library Hotel /Pod 51). What about real people, wanting local hotel info, who go straight to Google Maps? For this, we close the browser and restart a new session, with no history enabled (all our tests are done not logged into a Google account). Those are very different again from the Google Maps results for the exact same query, but where the query came from a referral from Google. An interesting observation is those results cover a wider geographical area. So Google is seemingly reading some other “signal” about user intent for searches on Google Maps directly, compared to being referred there by the Search Engine itself. As Google Maps becomes an ever more important “search engine” in its own right, some keyword ranking tools have added “Google Maps” as a search engine to get results from. We wanted to know how they compared to the “manual” results we got above. These results are completely different compared to what we got for the identical manual Google Maps search (previous table above). We believe this is because automated tools “tell” Google the location to search for by using the “Search near” functionality of Google Maps, which appear to give us the same results also (for brevity we didn’t include those results for this article). But note as above, this is different to what a user may do when they search Google Maps directly. Note also there’s a few different ways a user could do this and Google could explicitly or implicitly “know” the location to use. The Algonquin Hotel Times Sq. Not surprisingly, they’re very different also! One side anecdote from this piece of research, Marriot chain seem to be doing something right with their SEO, as their property was listed in every single search we did. They may have lessons worth studying in further detail! I hope to have some more on this type of local research next month.